Manually delivering paperwork to and from field technicians was time consuming and caused costly delays. Ferry Electric Company needed a solution that would expedite form processing. Implemented GoFormz to improve communication between office personnel and field employees. Technicians are dispatched their daily forms (from the front office) and those forms become instantly available for processing upon completion –– no more manual hand-ins. Ferry Electric Company, the award winning Commercial Electrical Contractor from Pittsburgh, PA, takes pride in their loyal customers, reliability and variety of electrical services. Offering a full range of electrical services to commercial, institutional and industrial clients, the Ferry Electric Company team manages several projects at once. Striving for customer satisfaction within every project, they needed a digital solution that would alleviate obstacles to productivity. The Ferry Electric Company team assessed many digital solutions, and ultimately were deciding between Canvas and GoFormz. After comparing the two side by side, the decision “was very overwhelming that GoFormz was the preferred outlet.” One of the standout reasons for this decision is that GoFormz allowed their team to create digital forms that look exactly like their traditional paper forms. With the familiar interface, almost no user training was required and it was easy for the team to use right away. “Instead of having to learn a whole new device and how to fill out the form, it removed that second learning curve. They only really had to learn how to do it digitally, they already knew the form, they knew everything they needed to fill out… versus Canvas, where everything looked different, all the info was presented differently,” says Kelly. 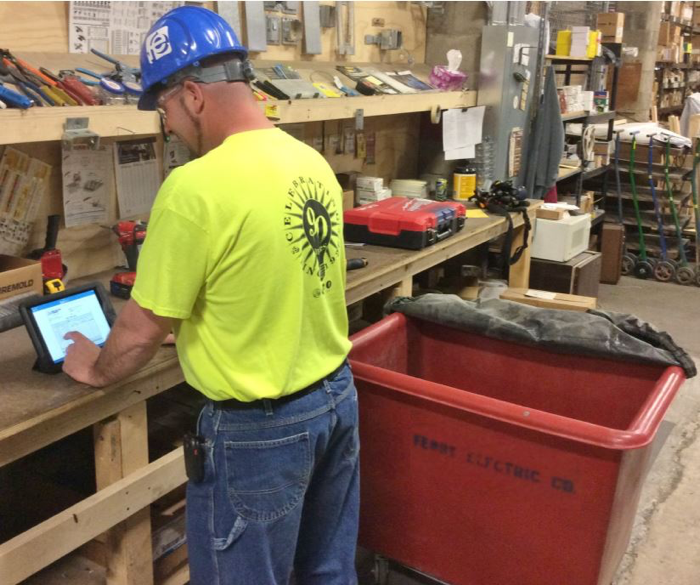 With GoFormz implemented as the standard mobile form solution for their team, field technicians were able to complete and instantly submit documents from their iPads within a familiar user interface (identical to their original paper forms). In addition to presenting a familiar user interface, GoFormz also provided a solution to the company’s manual-hand in strife. “Every single form that the guys will fill out, a copy automatically gets emailed to themselves so they can keep it for their own records, and then another copy will get sent to whatever department makes sense.” Now, documents are instantly routed to relevant team members, keeping each department informed, productive and responsive.